To celebrate Adopt-a-Shelter-Cat Month during the month of June, Purina Cat Chow is encouraging cat people to share their cat adoption or rescue story, picture or video online using the #MyRescueStory hashtag. For every #MyRescueStory shared on Twitter, Facebook or Instagram, Purina Cat Chow will subsidize a cat adoption fee – with a donation of $30 per cat and up to $1,500 per shelter – at one of its 50 shelter partners nationwide for a total anticipated donation of $75,000. Many of you already know my rescue story, but I wanted to share it again and pawticipate in this wonderful campaign! Mommy took these pictures of me while waiting for my adoption paperwork to be processed. It took fur-ever!!! My predecessor, Mommy’s beloved Tara, went to the Rainbow Bridge on July 7th of 2013 following a 2 year battle with diabetes, congestive heart failure, and a splenic mass. Mommy’s life was devoted to Tara and a part of her heart went with her when she passed. Almost as difficult was adjusting to living without a kitty. It was unbearable, and she knew she wanted another tortie, because we’re such special little ladies. She started looking at the adoptable cats on Petfinder from the same shelter that Tara was adopted from, hoping that another tortie from the same area might possibly be one of Tara’s descendants. (Tara was adopted at around age 7; she had been a stray who up until that time had not been spayed and likely had many litters.) I had been brought to the shelter by a nice lady who found me wandering around her summer camp. The day my picture popped up she fell in love! On August 20th I moved to my forever home! We've been pretty much inseparable ever since. I hardly ever get into trouble and Mommy says I am a purr-fect kitty. I just know that we were meant to be together forever! Help Purina find forever homes for 2,500 cats by sharing your rescue story. All you have to do is use the hashtag #MyRescueStory. 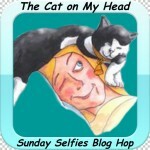 We're also pawticipating in the Sunday Selfies blog hop hosted by The Cat on My Head. 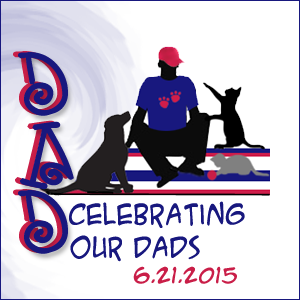 And Happy Father's Day to all the wonderful cat daddies out there, especially my Grandpa! Wish you luck, to quickly find a forever home, you look so cute ! That is a lovely story and those first photos are precious. I adopted Amelia from the same shelter Emily came from because I knew it would be a great way to honor my first kitty. We SO glad you got rescued, Truffles. We don't know who's luckier...you or your mom! Love hearing life stories, especially yours, Truffles when it means leaving a shelter to be with someone you love and who loves you back. How neat your mom fell in love with your picture! Thank you for sharing your story with us. I am sure you were meant to be with your Mom :) Happy Father's Day to your Grandpa. Your mom is so lucky she found you, Truffles! We believe in kismet...and love. What a great story. Being adopted by your human mom was the purrfect ending. We love happy endings. Truffles, your story had mom in tears...she is a wimp! She loves all kitties and gets very upset at abandoned or generally kitties that are unloved. I can empathize with you my friend. My blog will also tell my story of rescue as it will help another kitty. Is there anything we should do extra to make sure someone adopting a kitty will get the subsidy? Appaws! Great adoption story. August 20 was my Gramma’s birthday. We didn't know your story. You were meant to be with your Mommy, that's for sure.